Two weeks ago I went to the Anti-ageing Show in Manchester where I saw cosmetic procedures being performed life, expert doctors talking about various treatments and a lot of other things that anyone who looks after themselves might be interested in. One of the things that I watched was Dr Aamer Khan from Harley Street Skin Clinic in London performing filler injections life. He gave an explanation as to what fillers are, when they are used and he also explained the biggest misconception about Botox. Very often people talk about Botox, because often it's the only thing that they know about. Everyone heard of it and everyone seems to use it, but Botox is not always the best solution. It is only used for dynamic lines, i.e., the lines that appear when our facial muscles move. For static lines, i.e., lines that are there irrespective of our facial movements fillers may be the answer. 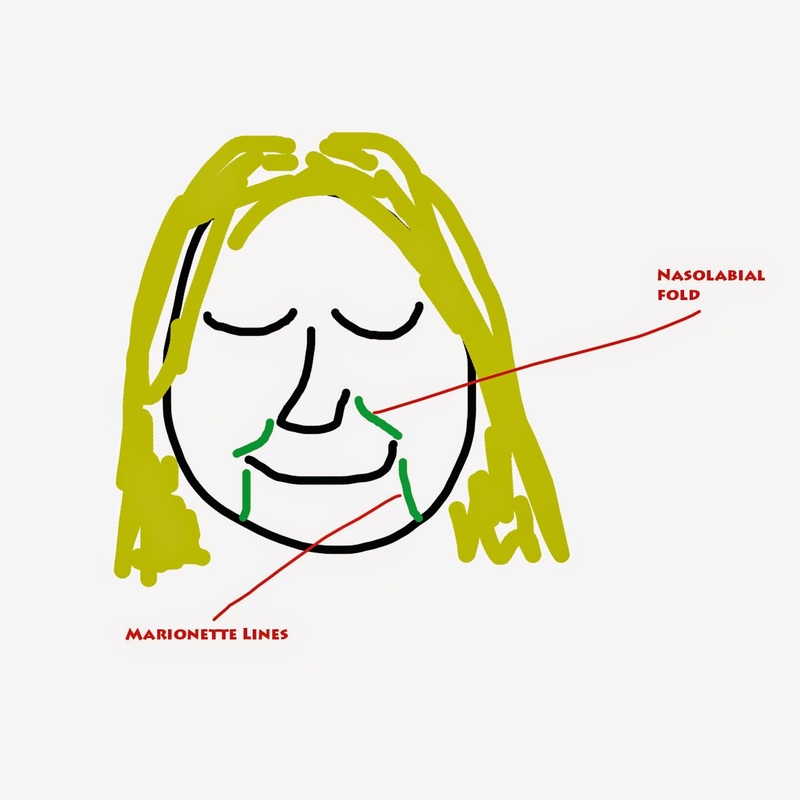 For a long time I wondered how fillers worked and how they addressed problems such as nasolabial folds, also known as laugh or smile lines, and marionette lines. I always thought that fillers get injected into the folds themselves, but that just doesn't seem to be the case and the evidence of it was the life show performed by Dr Khan two weeks ago. The folds are lifted by lifting cheeks and not injecting into the folds themselves. When the cheeks are lifted the folds soften up naturally due to the lifted skin. Totally makes sense, in this case you will not only achieve a reduction in smile and marionette lines, but you will get the killer Kate Moss's cheekbones too, pretty cool! So, one thing we must not forget is that Botox is not the answer to everything, don't forget to consider other things too as they may address your aesthetic needs a lot better. This partly explains why you need to go to a qualified practitioner. If you go to someone who only does Botox, no way that person will ever tell you that Botox is not the best solution for you. A good practitioner will understand the anatomy of ageing and he will know how to restore your face. "Don't use a permanent filler", doctor Khan says. Also, it is important not to overfill face and lift cheeks naturally. If any of these procedures is overdone, the person will lose her identity. As with every other procedure there are some risks with fillers. Mainly it is the technique itself. Blood vessels and nerves the doctor needs to be aware of. Using a qualified practitioner is particularly important if you have fillers injected around eyes as there are arteries affecting vision. Advanced knowledge of techniques and training is particularly important in this case. The main risks are bruising, swelling and discomfort. There is a low risk of allergies to hyalluronic acid filler, however, the risk is very low, i.e., 1 to 10,000, according to Dr Khan who only uses the mentioned type of fillers. Before fillers fix into their position they can be moved around a bit by massaging the face. Using a face cream is ok after the procedure, but it's important not to massage, press or stretch the skin. Alcohol is better to avoid after Botox for about 24 hours. With fillers it is usually possible to see if there is going to be any swelling, so a bit of alcohol after the procedure is ok if no swelling is envisaged. Certain medications can increase bruising such as anti-inflamatories, alcohol consumption within the last 48 hours before the procedure. Age also affects how much bruising we are going to get. The older we are the more likely we are to bruise. Results are immediate after fillers, but the filler softens up within a week or so. The bags around her eyes improved. The cheeks are more held up. Fillers can be used to address other problems, but I am not going to talk about them in this post. Let me know if you would ever consider having filler injections. What about Botox? Below is the YouTube Video for those who like to watch instead of reading. At the end of the video there is an extract of Dr Khan's speech in case you would like to see what it was like to be at the Anti-ageing Show in Manchester, 2014.